The Grand Finale Of The IBIS Trilogy - The Year's Most Anticipated Novel. 'One of the masterpieces of twenty-first-century fiction' - Literary Review / It is 1839. The British, whose opium exports to China have been blockaded by Beijing, are planning an invasion to force China's hand. Their demands--an island base on the Chinese coast from which to continue their trade and a princely sum in compensation for their losses. In Calcutta, Zachary Reid, an impoverished young sailor, dreams of his lost love and of a way to make his fortunes. His chance comes when the wealthy opium merchant Mr Burnham gives him a job of a lifetime even as his wife provides Zachary with other allures. Heading towards Calcutta is Havildar Kesri with his captain, Neville Mee, to lead a regiment of Indian volunteers in the upcoming war. Alert, battle-hardened, Kesri must turn his ragged, ill-equipped band of men, who know nothing about either China or sailing, into an efficient machine if they are to emerge out of this doomed expedition. In Mumbai, Shireen Modi waits anxiously for news of her opium trader husband only to discover that he has died mysteriously in Hong Kong and lost all his fortune in the opium blockade. She must sail alone to China as war clouds loom to reclaim his wealth and reputation--and in risking everything find a new life for herself again. In Canton, Neel becomes an aide and translator to a senior Chinese official as Beijing begins to prepare for war with Britain. The more he sees, the more worried he becomes--for the Chinese have neither the ships nor the artillery to match the British in modern warfare. The future seems clear but do the Chinese know it? 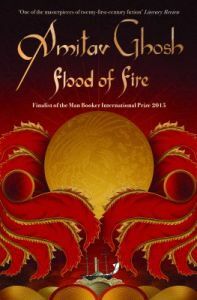 Fusing a profound understanding of history with page-turning narration, Flood of Fire--the final part of the Ibis Trilogy--is nothing short of a masterpiece. This is Amitav Ghosh writing at the height of his powers. Amitav Ghosh was born in Calcutta in 1956 and raised and educated in Bangladesh, Sri Lanka, Iran, Egypt, India and the United Kingdom, where he received his Ph.D. in social anthropology from Oxford. Acclaimed for fiction, travel writing and journalism, his books include The Circle of Reason, The Shadow Lines, In an Antique Land and Dancing in Cambodia. His previous novel, The Glass Palace, was an international bestseller that sold more than a half-million copies in Britain. Recently published there, The Hungry Tide has been sold for translation in twelve foreign countries and is also a bestseller abroad. Ghosh has won France's Prix Medici Etranger, India's prestigious Sahitya Akademi Award, the Arthur C. Clarke Award and the Pushcart Prize. He now divides his time between Harvard University, where he is a visiting professor and his homes in India and Brooklyn, New York.